Associated Terminals is widely known throughout the maritime community for its midstream cargo handling activities on the Lower Mississippi River, with its modern fleet of eight high-speed floating cranes and the eleven midstream berths at which the company operates. However, there are many more aspects to the services the company provides to its customers, making Associated Terminals one of the most diverse cargo handling and terminal operating companies in the United States. Associated Terminals operates the Myrtle Grove Midstream Terminal (MGMT), a floating grain elevator at mile 56 on the LMR, specializing in the transfer of grain and grain byproducts between barges and ocean vessels. Bulk cargo handling between ocean vessels and ground storage/surface transportation is a primary service offered by Associated Terminals. At the Port of St. Bernard’s Chalmette Slip and the Port of South Louisiana’s Globalplex Terminal, the company operates over 250,000 square feet (23,225.7m2) of covered warehouse space for bulk cargoes, as well as over 18 acres of open storage space. Associated Terminals has the ability to load cargoes to trucks, railcars, or back to barges depending on the customer’s requirements. At both the Chalmette Slip and Globalplex,Associated Terminals offers general cargo handling and storage, with all the equipment necessary to competitively move and store steel products, metals, and containers. These two facilities have combined covered storage of over 400,000ft2 (37,161m2) and hard surface laydown areas in excess of 200,000ft2 (18,580.6m2) square feet. In the Chalmette Slip, Associated Terminals offers a slackwater harbor that is perfect for project cargo transfers from ocean vessels to barges or to ground storage / transportation. At the Globalplex facility, the newly commissioned Finger Pier allows Associated Terminals to work two deep draft vessels simultaneously, and barges can be positioned and loaded directly from a vessel on the back side of the Finger Pier. At its Port Allen, LA terminal, the company provides over 45,000ft2 (4,180.6m2) of warehouse storage, 130,000ft2 (12,077m2) of outside storage, as well as the ability to load bulk cargoes from trucks via hopper/conveyor directly to barges. The company’s In-Plant Services Division offers OSHA and MHSA certified personnel and equipment to handle its customers’ cargoes safely and efficiently at their plant sites. The company has been providing this service at multiple barite plant locations in coastal Louisiana for over a decade. Finally, Associated’s sister company,Turn Services, offers barge fleeting, shifting, and cleaning services at five locations on the LMR including Myrtle Grove (serving the MGMT) and Meraux, LA (serving Associated’s midstream berths there). Turn operates 20 towboats and 6 crewboats. If you can’t beat ’em, join ’em! With over a combined 150 years of vessel stevedoring and inland logistics experience, Cooper/Consolidated is a name that carries a lot of weight. Prior to 2003, Cooper/T. Smith Stevedoring (CTS) and Consolidated Terminals and Logistics Company (CTLC), both Mississippi River stevedoring and logistics providers, were operating in a fiercely competitive market that was trending toward an overcapacity situation. While the two companies’ bread and butter strengths may have been different, they shared many common approaches to business and their customers. CTS was a globally known stevedoring expert on all three US coasts with a variety of marine service companies in addition to its fleet of high-capacity cranes. CTLC was a powerful force in the world of barge freight trading, barge fleets, inland terminals, trucking, rail assets, and logistics services which became the industry leader with a focus on value-added service packages. So there were two terrific companies, both experts at what they did, and with the commitment to adapt to an ever changing landscape with a great focus on their customer’s needs. This commitment to the industry, as well as to customers, was put into high gear on 1 January 2003 with the formation of Cooper/ Consolidated. Cooper Restaurants — Ruth Chris, Felix’s, Blue Gill. CGB Fertilizer — wholesale & retail fertilizer company; Diversified Services — crop insurance. 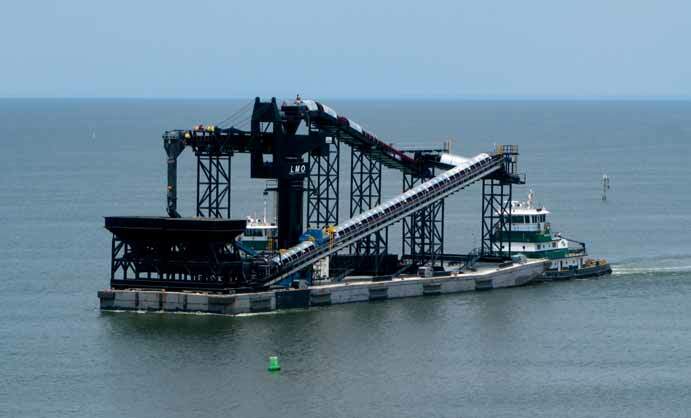 Louisiana Mid-Stream One (LMO) is a unique barge-mounted shiploading system operated by Louisiana Mid-Stream Terminals specifically designed to overcome the quality issues of traditional mid-stream transfers. The LMO provides coal and petroleum coke exporters utilizing the Mississippi River with the quality control features not found in other mid-stream loading operations, such as a magnet, a mechanical sampling system, a belt scale, and a system for water drainage and collection. Working in tandem with a separate barge-mounted feeder crane alongside the vessel, products from barge are directly fed into the LMO’s receiving hoppers, up a series of conveyors to a retractable loading boom with a rotational spout which feeds the vessel. Operating on the Mississippi River (Mile Marker 134) at Cooper/Consolidated’s mid-stream buoy system in LaPlace, Louisiana, the LMO allows for the continuous collection of mechanical samples from the entire cargo loading to the vessel, whereas traditional crane-only transfers allow sampling for only a portion of the barge cargo. Located after the receiving hoppers, the LMO’s two-stage mechanical sampler (James A. Redding) collects a full stream cut primary increment from the LMO’s C2 conveyor belt. These primary increments are then processed through a crusher and a secondary sampler to produce the final laboratory-ready samples. This sampling system conforms to the ASTM D7430 standard for mechanical sampling and provides a representative sample throughout the cargo and not just from a portion and/or top of a barge. The system is operated and maintained by the independent third party sampling and testing company, SAI Gulf. The LMO can simultaneously feed and combine product from multiple barges to meet rigorous quality specifications, greatly enhancing the uniformity of export cargo. LMO’s two main receiving hoppers have four variable speed feeders that can homogenously combine different qualities. The two main receiving hoppers have grizzly screens on top to prevent oversized product or large contaminants from entering the system. The hoppers can also provide for water drainage of excessively wet cargo, which is collected and disposed through a pump and collection system. The rotation spout provides the ability to trim vessel hatches without delays and eliminates placing mobile equipment in the holds. Another value-added service provided by the LMO is tramp metal collection. A self-cleaning magnet is mounted before the mechanical sampler on the C2 conveyor. This magnet removes tramp metal from the conveyor as the product passes under it, thereby reducing contamination and potential damage to the customer’s receiving systems. These unique features of the Louisiana Mid-Stream One greatly enhance the control of quality for mid-stream loaded cargoes by providing more homogeneous combinations of coal qualities, control of moisture, contamination prevention, and the accurate measurement of the true cargo quality when customers specify an ASTM D7430-Part A-Condition B Mechanical Sampling requirement.